After having to wait more than two months for his 2018 debut, Double-A Hooks right-hander Forrest Whitley seems to have suffered another setback. 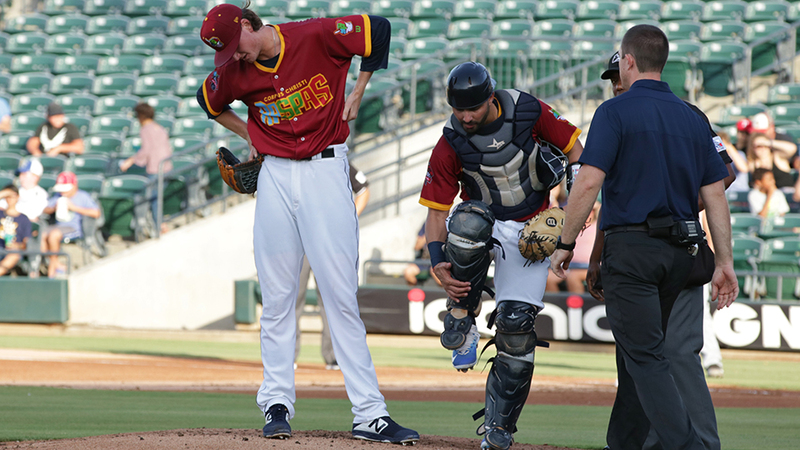 Houston's second-ranked prospect was lifted after just 17 pitches in the first inning of Corpus Christi's 3-0 victory against Arkansas on Thursday night at Whataburger Field. Astros general manager Jeff Luhnow described the injury to the Houston Chronicle as "left oblique discomfort." Whitley, MLB.com's No. 9 overall prospect, was sidelined for 50 games to start the season after violating the Minor League Drug Prevention and Treatment Program in February. He returned in June with three consecutive scoreless starts before being tagged for 10 runs over an 8 1/3-inning span in his next two outings. The 6-foot-7, 195-pounder entered Thursday night's outing with an 0-1 record, a 4.43 ERA and a .184 opponent's average over 21 innings in six contests. The 20-year-old stepped back off the mound for an injury delay after striking out Beau Amaral to open the game. He stayed in and issued a free pass to Chuck Taylor before getting Eric Filia to bounce out weakly to shortstop. Whitley made four pitches to the next batter, Joey Curletta, but stalled again, crouching down before signaling to the dugout. He motioned to his left side as he was met by catcher Lorenzo Quintana and Hooks trainer John Gregorich. After a brief conversation on the mound, Whitley walked off the field under his own power with Gregorich and again gestured to his left side. Luhnow told the Chronicle he expects to learn about the extent of the injury Friday. Ronel Blanco (1-0) took over for Whitley in his Double-A debut, striking out eight and walking one in four hitless innings. The Travelers picked up their first hit on Logan Taylor's leadoff single in the sixth against Alex Winkelman. The left-hander allowed two hits and a walk while striking out four over the final 4 1/3 frames to earn his third save of the season.